WhatsApp Messenger is the most popular messaging application where daily 30 million messages are shared. Almost 200 million people in India use whatsapp. 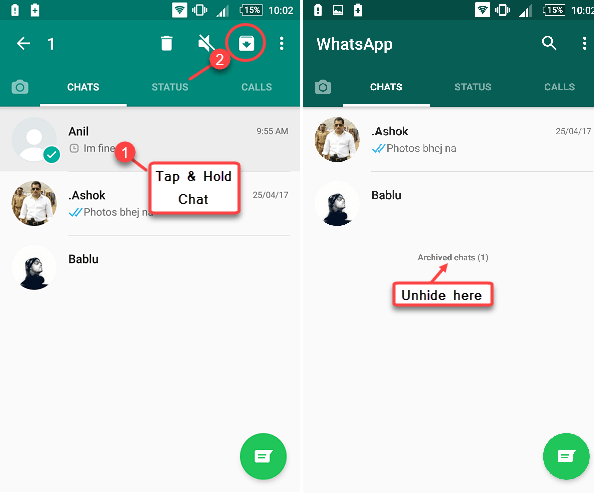 Although WhatsApp uses everyone but most of them not aware about its some hidden special features. Today I’m sharing with you some amazing whatsapp tips & tricks. To make any text bold, you have to type something like this in the text box. *How are You*: Add “*” after/before of any word or text line. 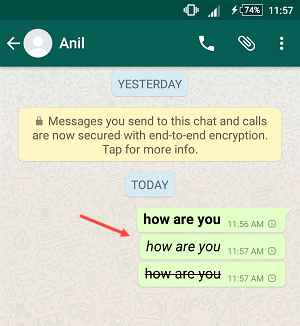 _how are you today_: Add “_” after/before of any message. To add strikethrough to any text, type something like this. ~ How are you ~: You have to add “~” after/before text. 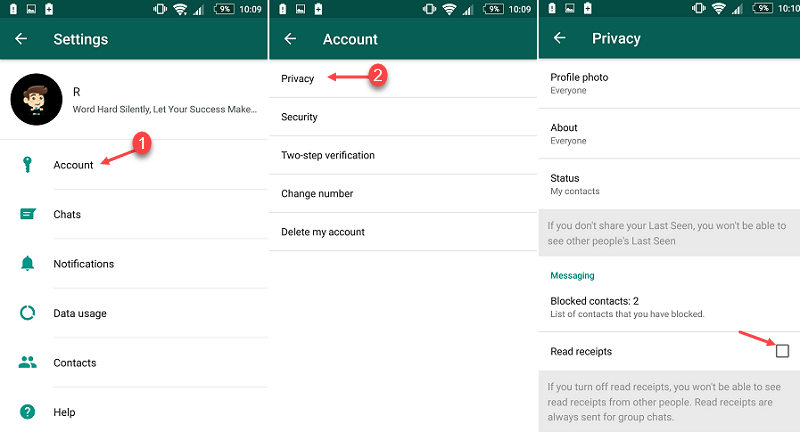 You can enable 2-step verification for the security of your WhatsApp account, by doing this, you will have to enter the 2-step verification PIN whenever you install WhatsApp. 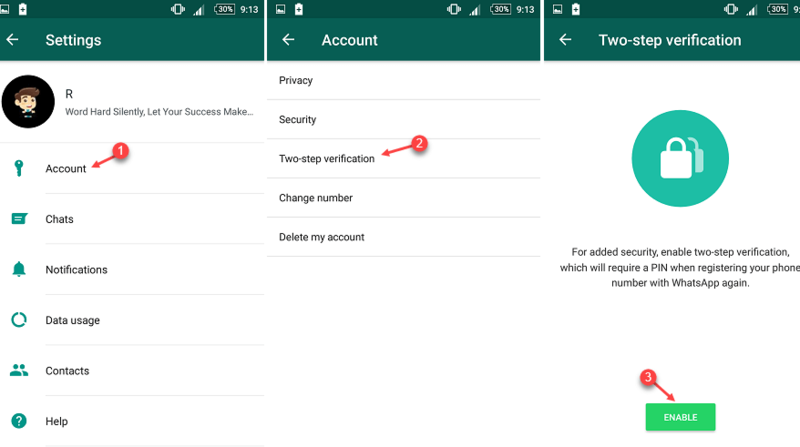 To enable two-step verification, open Settings – Account, here you can see the option of two-step verification. Tap on two-step verification and set your PIN. While chatting, there are many messages that you have to watch over and over again, such as if someone has sent a password or a PIN, or your favorite message, you can bookmark such messages. By bookmarking you will not have to search that message, you can see it immediately. To bookmark any message in Chat, tap and hold on the message, you can see the options at the top. If you want to see your bookmarked message then open options on the Chat tab and tap Starred Messages in it, you can view your bookmarked message here. You can edit your photo before sending to anyone, you can add text, smileys, resize it. 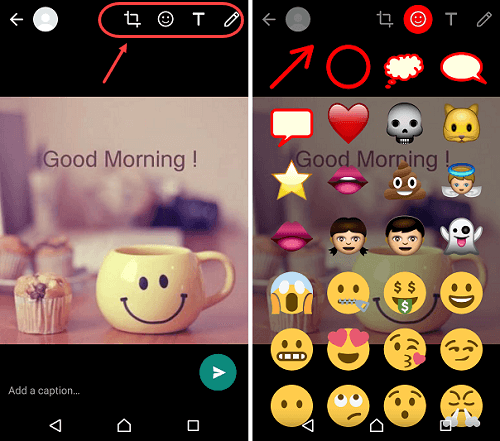 Now you can see the editing tools on the top of the photo like Text, colors, Smileys, resize. Like a photo you can also edit Video. 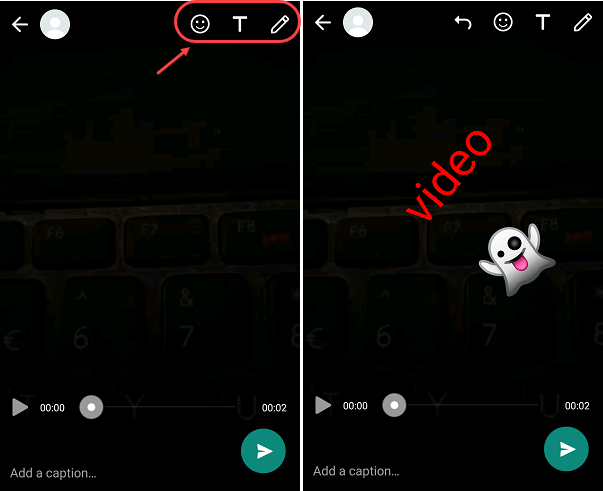 Now on top of that video you can see the editing options, you can add things like color change, add text, add smileys to the video. The feature of the new status has just been released. In this status feature, you can add animated images, videos as well as text messages. Your friends can also see your status and comment in it. This status will remain for 24 hours, then it will be removed. tap on + here to set your status, you can add video, image any. After adding status tap on send. Just now your status can be seen by all friends of your friend list. This status will remain for 24 hours after that will be removed. 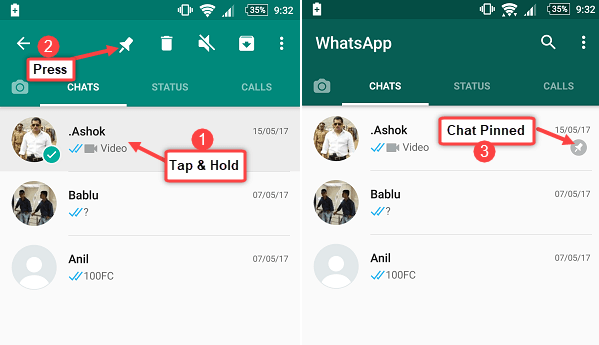 You can change whatsapp Notification light according to you. If your phone supports led notification then you can change the color of your notification light on whatsapp. 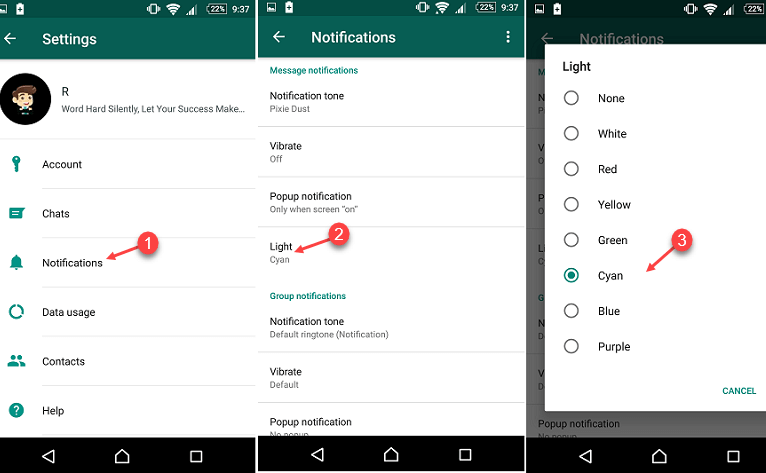 To change Notification Light color, tap on Settings – Notifications and open it. Here you can change your notification light in different colors in the Light option. Suppose you have to email someone important chat, you can do that too. You can send complete chat (with images & Video) to anyone via email. As soon as you Tap on Email chat, you will get 2 options (1) Without media (2) Attach media, without photo, video only to send chat, then select media or select attach media. Just send an email address type now. In the Quote reply feature, you can reply by quote the message of the person in the front. You can see this thing in the image below. You can share your location to tell your friend where you are at the moment. This is really a very important feature. 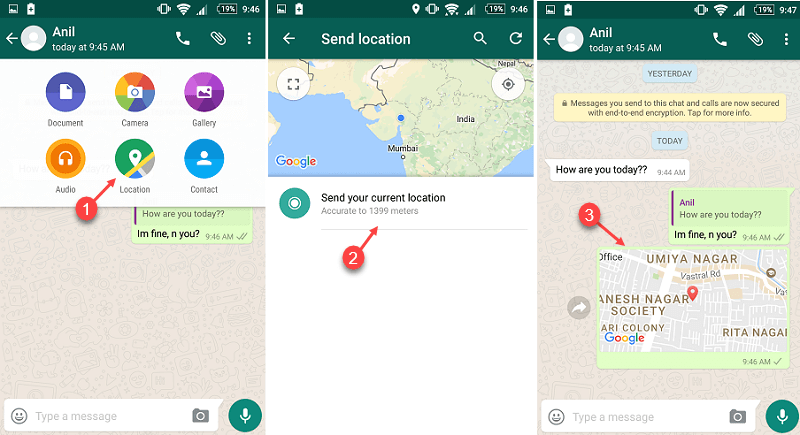 Suppose you have to go to some of your relatives home and you do not know his address, you are unable find his house, in such circumstances, you can ask that relative to share the location on whatsApp. As soon as he will share the location, you can see his location on Google Map. To share the location, tap the Sharing icon on the Chat screen and select the location, as you can see in the image. 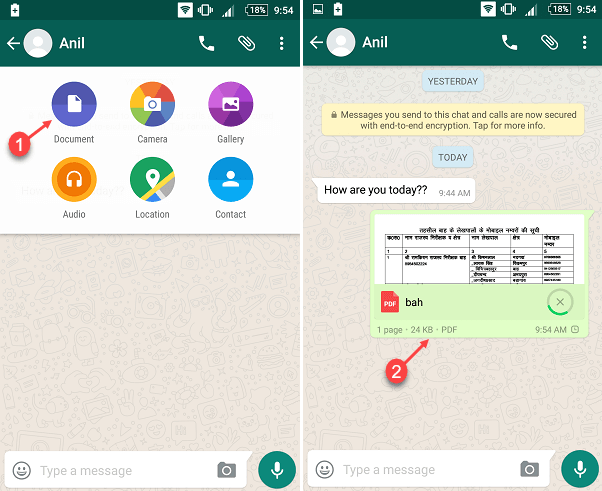 Now you can share documents on WhatsApp. To share documents such as PDFs, tap the sharing icon on the Chat screen to select the document option. 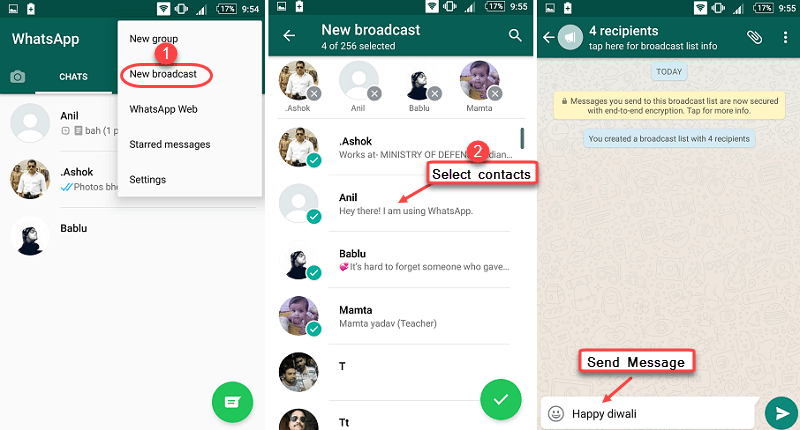 With WhatsApp’s broadcast feature, you can send your message to 256 people simultaneously. Suppose you have to give wishes message to all your friends, then you can broadcast this message to all your friends. To broadcast, open the Chat tab, tap on New Broadcast in its options. Now select all your friends who want to send a message. After selecting Friends, now share your message, image, Video, whatever you want to share. If you chat with someone regularly then simply put your chat shortcut on your phone home screen, so you don’t need to open whatsapp and find chat. You can hide any chat or hide all chats from the Chat section. To hide a single chat, tap and hold on any chat. You can see the options in which you have to press the arrow down button,now your chat is archived. To unhide your chat, Open chat section and you can see Archived chat, open it an unarchive it. 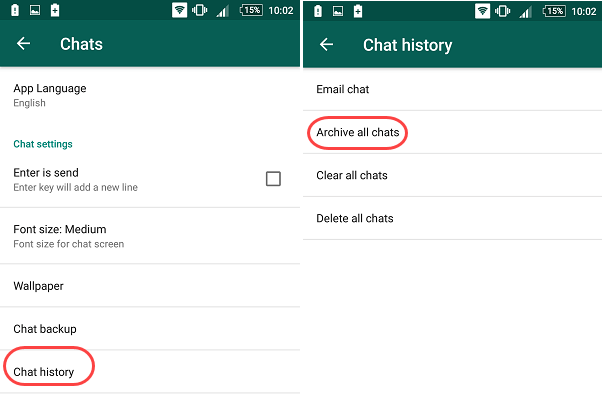 Tap Archive all chats in chat history,your all chats will be hidden. If you have lots of friends then it is obvious that you will receive lots of photos, videos every day. Now if you download all the videos, photos, then your internet data also waste. 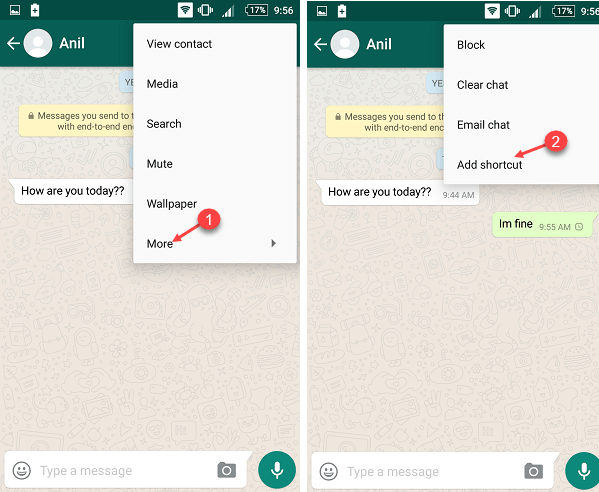 If you selected Media Download Automatic in WhatsApp, then all photos, videos will auto-download. But you can control it and save your data. 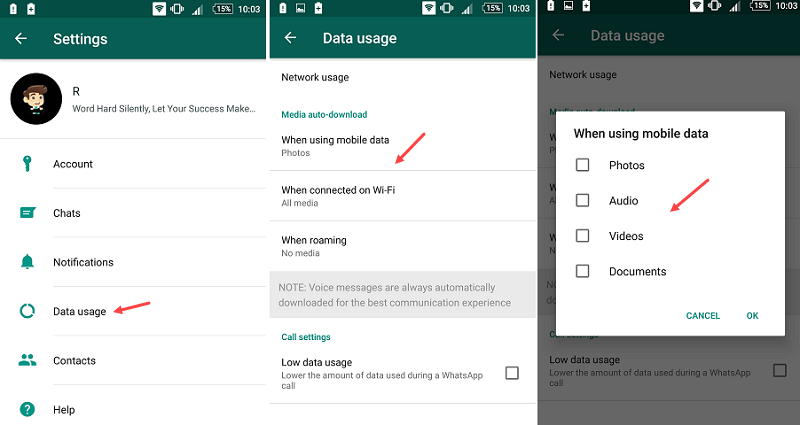 To disable Auto-media download, go to Settings – Data usage. You can deselect all options Photos, Video, documents, audio on Media-auto download in Data usage, now they will not auto-download. When you sent a message, and your friend has read your message then you can see blue tick. If you run a group then blue tick is very useful, you can see who has seen your message. If blue tick is enabled in WhatsApp then all your friends can know whether you have read their message or not. If you feel that your privacy is threatened with Blue Tick, then you can disable it. To disable Blue Tick, open Settings – Account – Privacy. Deselect Read Receipts in Privacy. 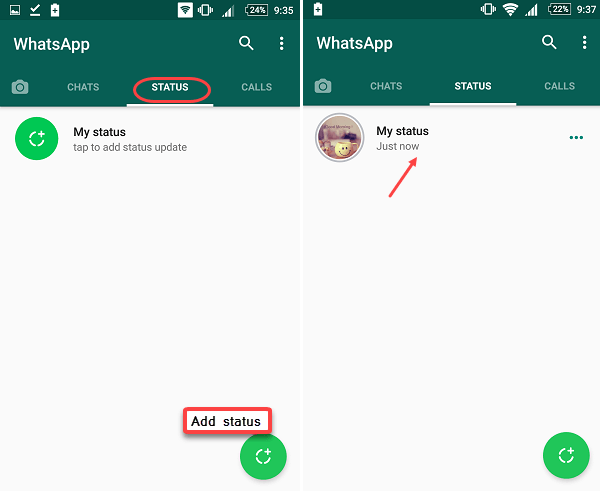 If you want to change your WhatsApp number, you can also do that, your chats, contacts, groups, settings will not be removed. 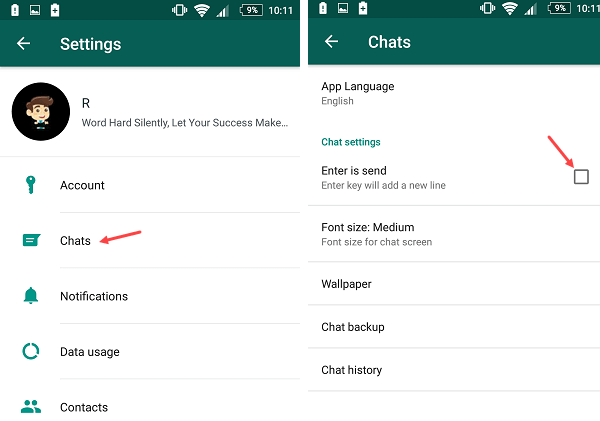 If you are working on the Internet on computer and are also doing important chat on WhatsApp on Mobile, it is a bit difficult to work together. But you can access WhatsApp in your browser on your PC. 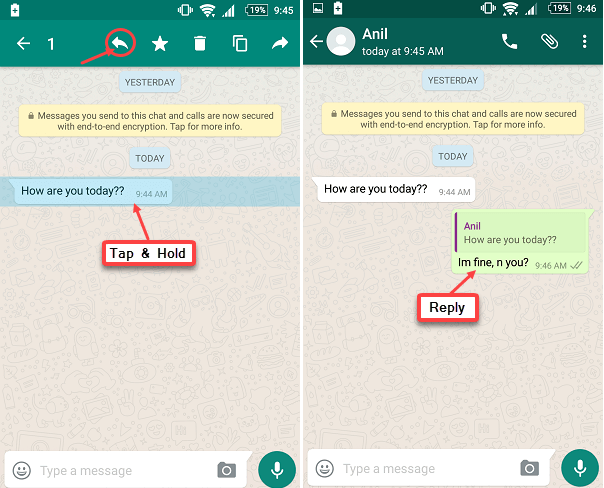 Now open your Mobile whatsApp application, here you have to open the option and tap on the WhatsApp web. Now using QR Scanner scan the QR code on web whatsapp. 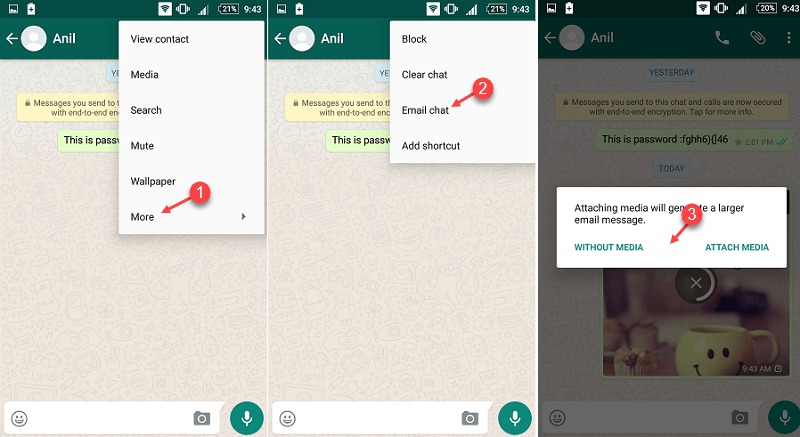 Now you can access your whatsapp on your PC. While you type the message and press the enter ↵ button of Phone keyboard, normally it is react as Send button. But you can change this and add new line in chat box by pressing ↵ enter button. In Chats, check/uncheck “Enter is sent”. You have many friends and you do chat with everyone, but there are some special friends with whom you chat every single hour or repeatedly. Now the problem is that how you open your chat of that friend out of a lot of Chats, suppose you have 30 chats in your whatsapp chat section and you have to open a chat of a particular friend again and again, it is a bit difficult. First tap on the chat you want to pin it and hold it for a few seconds, you can now see the Pin icon at the top, just tap on that pin icon, now you can see your chat is pinned and showing on top. If you want to unpin chat, Tap & hold on chat and tap on unpin icon. 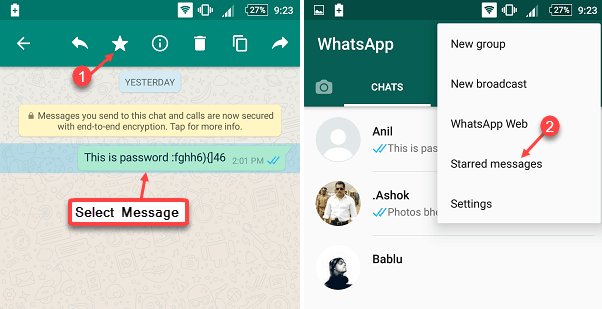 WhatsApp Messenger is constantly updating and many new features are released in latest update, so you will know about the upcoming new features here. Relevant information. Also add information about PAN CARDS, PASSPORTS, SOCIAL SCHEMES, EDUCATIONAL LOAN SCHEMES, DRIVING LICENCE, INSURANCE POLICIES, E-WALLETS etc.